I have been distracted from the 12th Century recently by a visit to a Suffolk church – or rather, by the intriguing single large stone opposite it. The stone looks for all the world like a Viking or early Christian hogsback grave marker, and has very clearly been shaped. But there are no hogsback stones in this part of the UK; they are only to be found clustered in the Northwest and Scotland. So what is it? And what’s it doing here? – the stone is not native, it’s been imported. This lovely blog post was of great help in researching that liminal phase as the Vikings became good Christians, for the short story that demanded to be written. OS grid reference: NY 5165 3016. A short walk in an easterly direction from market Square and king street (A6) in the centre of Penrith is the ancient church of St Andrew, a Saxon foundation. At the north-side of the church stands a slight mound on top of which are two pillar-crosses and four hogback gravestones – collectively known as the Giants Grave. 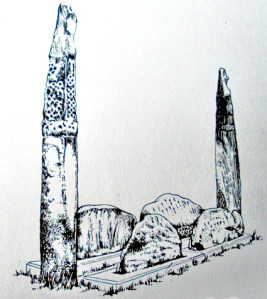 These stones are said to have been placed over the burial site of Owain Caesarius, legendary and heroic king of Cumbria during the early 10th century, who was said to have been a giant of a man. Also in the churchyard is the Giant’s Thumb, a damaged Anglo-Norse wheel-headed cross dating from 920 AD. One of the things I most love about Gozo – that is, apart from the unbelievable archaeology, the unspoilt scenery, and the glorious weather (well, mostly!) – is the fact that the whole island is steeped in the Roman Catholic faith. Now I personally am not a believer, but I have a great deal of respect for those who practice their faith; and here in Gozo I can talk to people who have had an unbroken religious practice since St Paul landed on the islands in 60AD. That kind of experience simply isn’t possible in the UK, with our turbulent Tudor history, and it’s an absolute Godsend for someone who writes mediaeval historical fiction. Let me give you an example; flights from Stansted to Luqa get in about 9:30pm. I generally get a taxi from the airport to the Gozo ferry, in the (usually vain) hope that I catch the just-after-10 sailing and don’t have to sit around at the ferry terminal for another hour. (Top tip; do NOT attempt to drink the liquid that the “coffee machine” produces. <shudders>) This is also a great opportunity to catch up on island happenings. I always ask if there’s anything going on that I should go and see; imagine my delight this time when the taxi driver casually mentioned the Our Lady of Sorrows processions on the Friday before Holy Week. But the bit that sticks in my mind most was when I popped into Xaghra’s main church earlier in the week to admire the statues. One of the men fixing banners to the wall asked if I was interested in the church, and I clearly made the right noises; I was treated to its history back to its founding in the 17thC, along with the part his family had played – including hiding some of the church’s treasures from Napoleon’s invading army. It was so clearly a central part of his life. Then the mindblowing bit – he started to describe the procession; 700 official participants from a village whose population is around 5,000. Every family has at least a couple of members involved. From the looks of this photo – again from the 2016 procession – it looks to me like the whole village turned out to follow the statue!